Pet rescue #506 is one of the most difficult levels of the game and it’s probable that you’ll lose many lifes till you’ll make to complete it. Your first object is to clear whole columns left of the pets and the metal boxes in order the whole columns to be moved left. Besides the single pet, in the right part of the screen under the ledges, has to be moved left to the 5th column (at least) before you’ll be able to see the line with the blasters. 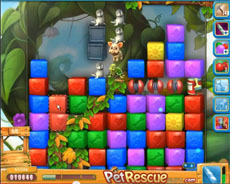 Now it’s the most difficult part of the screen, while you clear the blocks under the pets in order to make them move down and the screen to move on. Don’t get disappointed if you lose many lifes in this effort (we did it after playing the level again again). In the level you ‘ll activate the rocket three times. The last one you have to keep it to rescue the pets using it in the first column. Stuck on Level 506? No worries.. watch our vid!